Cerodontha (Butomyza) eucaricis Nowakowski, 1967; Spencer, 1976. Fauna ent. Scand. 5(1): 206, fig. 358. Cerodontha (Butomyza) eucaricis Nowakowski, 1967; Spencer, 1990. Host specialization in the world Agromyzidae (Diptera) : 347, 348 (fig. 1319), 351, 380. Leaf-mine: Linear mine. 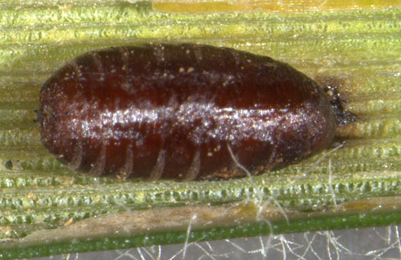 Pupation either in the leaf at end of mine or externally (Spencer, 1976: 207). Mine upper-surface, in the central part of the blade. Frass in a few large lumps; often all frass still is contained in the larva's intestine. Larva solitary. Puparium in the mine, fixed ventrally with dried frass (Bladmineerders van Europa). Dark brown; posterior spiracles arising from a common projection, one bulb being long, hook-like, with the lower two ones small (Spencer, 1976: 207). The puparium is illustrated in Bladmineerders van Europa. Time of year - mines: June to September (Bladmineerders van Europa). Distribution in Great Britain and Ireland: Huntingdonshire (Woodwalton Fen), Surrey and Glamorgan (Spencer, 1972b: 100). Distribution elsewhere: Not uncommon in Europe including Sweden, Finland, Germany, Poland (Spencer, 1976: 206), The Netherlands (Bladmineerders van Europa), Belgium (Scheirs, de Bruyn and von Tschirnhaus, 1999), Germany (Spencer, 1976: 554), Czech Republic, French mainland, Hungary, Lithuania, Poland and Slovakia (Martinez in Fauna Europaea). Also recorded in Canada (Spencer, 1976: 206).